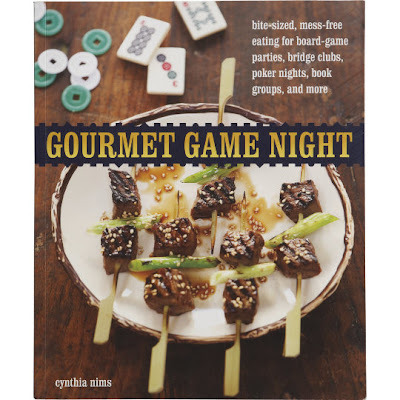 The book itself is a treasure-trove of surprisingly good recipes. I've been drooling over the Homemade Pretzel Sticks with Three Mustards and the Banana Bread with Hazelnut Cream Cheese Filling (I know, seriously.) The book even has a list of some great game stores in the US and gives props to not only the classic games but also to Ticket To Ride and Apples To Apples. Nice! The ever-popular cheesecake makes an easy transition to game night, taking on a shallower square form that’s easy to cut into finger-friendly pieces. If you’re unable to find simple chocolate wafer cookies (the Nabisco brand wafers are a great choice), you can use graham crackers crumbs instead for the crust. In a medium bowl, combine the cookie crumbs and melted butter and stir to evenly mix. Put the crumb mixture in a 9-inch square cake pan and press the crumbs evenly across the bottom of the pan. Bake the crust until set, about 10 minutes. Set aside to cool. Reduce the oven temperature to 325 F.
Melt the chocolate in the top of a double boiler over medium heat, stirring occasionally. (Alternatively, melt the chocolate in a microwave.) Take the top bowl from the heat and stir in the coffee liqueur and espresso powder. Set aside to cool. Whip the cream cheese and sugar in a stand mixer fitted with the paddle attachment until well blended. Add the eggs and continue beating to make a smooth batter, scraping down the sides of the bowl as needed. Use a rubber spatula to fold in the chocolate mixture until thoroughly incorporated. Pour the batter onto the cooled crust and spread it out evenly. Bake the cheesecake until set, 35 to 40 minutes. Set aside on a wire rack to cool completely, then refrigerate for at least 2 hours before serving. Cut the cheesecake into 5 strips each direction, for 25 squares. Arrange them on a platter or tray and serve. More gaming this Monday night at the University of Waterloo... Much fun was had. A game of the delightful little 1-2 player co-op Onirim while we waited. Everyone started with Ricochet Robot when the night began. ...um, Jump Gate? This year Games Magazine makes an... "unusual" choice for the best game of the year. Not a bad choice as far as I know, as I have yet to play the game to decide, but a game that I have never heard of and has made little to no waves in the gaming community. I must say I'm curious to play Jump Gate, given that Small World and Torres have won previously. But does anyone have a copy so we can try it? ...and I keep reading BoardGame News. Really, if you care at all about the new games coming out this Fall you should check out the site. 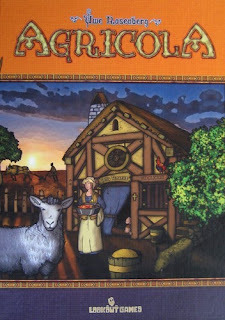 The other Eric Martin does an amazing job previewing the new releases and it is probably the best and most up-to-date English-language site for board games. UPDATE: Okay, okay, I take that back... Here's one game from Zoch that sounds just awesome! Oh, yes, it's good. In fact, it's the first American-style strategy game that I've really enjoyed despite the limited decisions and ridiculous swings of luck. Now if only we could get the play-time down from almost 3 hours to the supposed 60 minutes it should actually take, then I'd say this was the best board game so far this year. It's definitely the most fun. 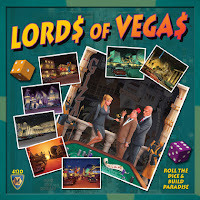 Four of us settled down with some beers and snacks last night to play the Mayfair Games' new Lords of Vegas, by Mike Selinker and James Ernest of Cheapass Games fame. I had watched a very positive Dice Tower review so the excitement was there. And I am happy to say the game was actually as fun as Tom Vasel had said. It reminded me at first of Acquire in the building and joining of casinos but eventually the game became a pretty wild strategy/luck mish-mash. While playing it, I actually felt the same way I did the first couple times I played Settlers of Catan due to the crazy interaction, tons of dice-rolling and trading, and just enough tough decisions to make you think you have some control. What this game seems to have that Settlers missed is some real balancing mechanisms both in the scoring and the play. On one play I had three actions in a row ruined by bad die rolls. On the following turn, I flipped a card that gave me control of the largest casino on the board. Awesome. Now, wild random swings of fortune are usually something I despise in games but they seemed to benefit all players fairly evenly last night. 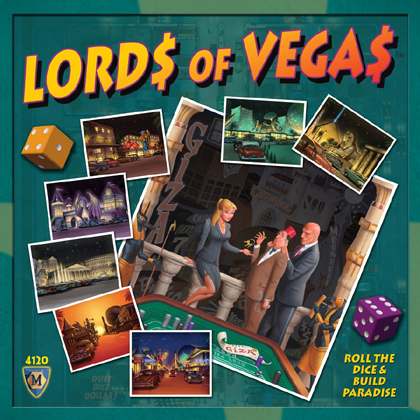 And given that this game is about gambling and building casinos it actually seemed quite appropriate and thematic. But it's hard to say if the luck will balance out every time. People say that about Settlers and I think they're wrong. We'll definitely be playing this one a few more times to find out. I have one complaint, though. The graphic design is dated, cluttered, and not up to Mayfair standards, especially for such a winning title. It doesn't break the game by any stretch but for someone who is colour-blind living a dimly lit condo, there were a few moments of confusion trying to find the red and green transparent chips on the dark sections of the board.